Andromache was one of the most famous female mortals of Greek mythology. Andromache would appear in, and after, the Trojan War, and although a Trojan by marriage, was highly regarded as the epitome of womanhood by the Greeks. Andromache was born in the city of Thebe in the region of Cilicia in the southeast Troad. It was a city ruled by King Eetion, although it was a city subservient to Troy; King Eetion also just happened to be the father of Andromache. The mother of Andromache is not named, but it was said that Andromache had seven, or eight, brothers. Andromache grew to be one of the most beautiful of all women, and as befitting of her beauty and her position, Andromache would marry Hector, the son of King Priam and heir to the throne of Troy. Thus, Andromache would leave Thebe and set up a new home in Troy. 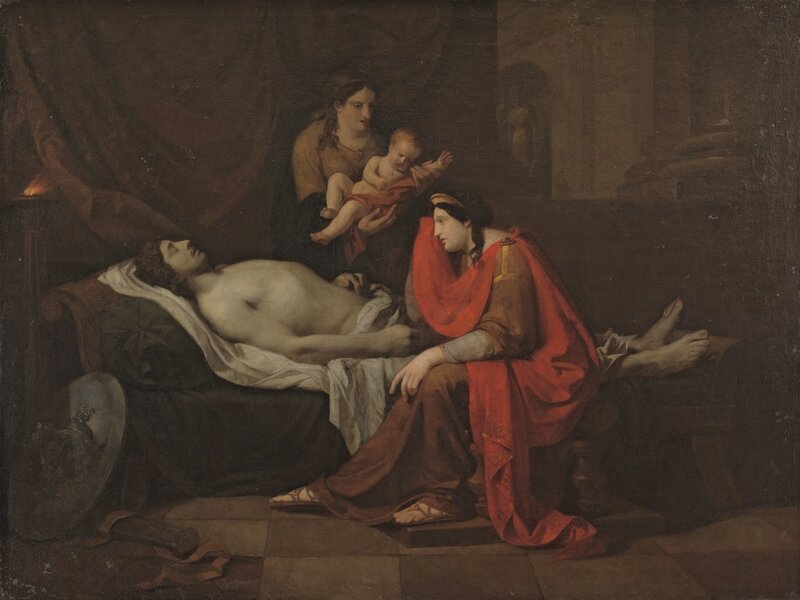 Thebe itself would be sacked during the Trojan War by Achilles, and Andromache’s father, King Eetion and seven of her brothers, would be killed during the fighting. ​After death, King Eetion would be honoured by Achilles, for the father of Andromache was allowed to lie on the funeral pyre adorned in his armour. One of Andromache’s brother’s, Podes, perhaps escaped the sacking of Thebe, but he would later die at the hands of Menelaus during the Trojan War. Andromache’s mother was also captured by Achilles, although she was later ransomed, and mother and daughter were later reunited in Troy. Andromache’s mother would die before the war’s end through illness. 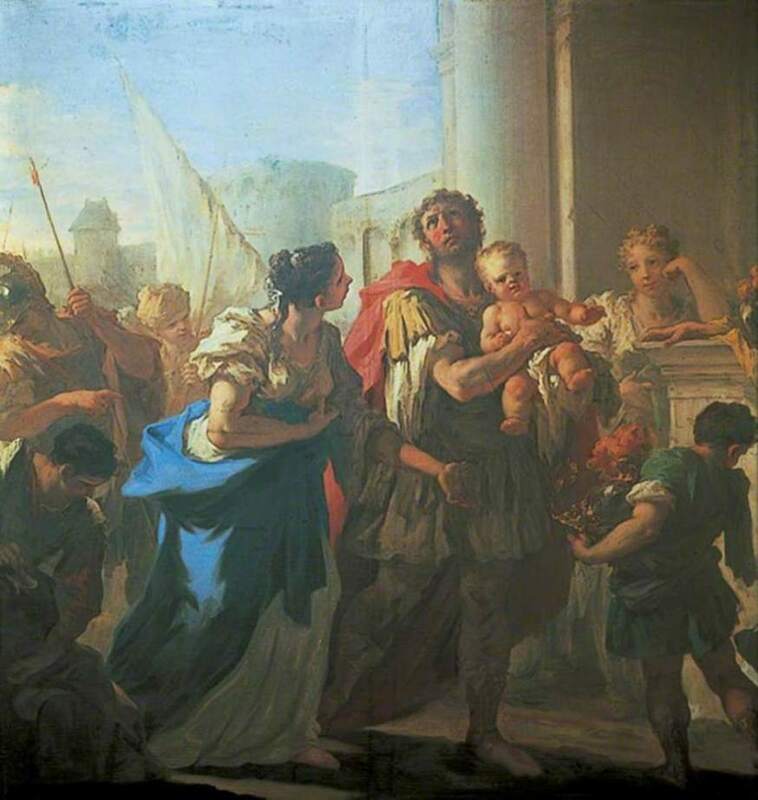 The sacking of Thebe is more famous today for it was from Thebe that Achilles took Chryseis, the woman who would cause disagreement between Achilles and Agamemnon. Andromache would often be compared to Helen, the wife of Menelaus, and although Helen was described as the more beautiful of the two, the characteristics of Andromache ensure that the wife of Hector was perceived as superior to Helen. ​Andromache was described as being loving, loyal and dutiful, all characteristics of the perfect wife to the Ancient Greeks. If peace had prevailed then Andromache would have become Queen of Troy, and Andromache did her “duty” by providing an heir for Hector, for she gave birth to Astyanax. Of course peace did not prevail, and soon the Achaean forces were at Troy, and whilst Hector would blame his brother Paris for the trials and tribulations of Troy, Andromache blamed Helen. During the Trojan War, Andromache would act the role of Hector’s wife perfectly, supporting him, and even offering him military advice. Andromache would also ensure that Hector never forgot his duty as husband and father though. Hector’s own sense of duty, as defender of Troy, would eventually seem him face the Achaean forces once too often, and the Greek hero Achilles would strike the son of Priam down. Thus, Andromache found herself as a widow. The loss of her husband would soon be followed by the loss of her city, for Troy would soon fall to the attacking Achaean forces. Few men survived the sacking of Troy, but most of the women did, and Andromache and Astyanax found themselves captives of the Greeks. The Greeks were fearful of leaving a son of Hector alive; for the vengeful son might come back to haunt them in future years. Thus it was decided that the son of Andromache and Hector would be killed, and the baby was thus thrown from the walls of Troy. As to who killed Astyanax depends on the source being looked at, for some name Talthybius, the herald of Agamemnon, as the murderer, whilst others name Odysseus or Neoptolemus. Afterwards the Women of Troy would be given to the prominent heroes of the Achaean forces, and whereas Agamemnon took Cassandra as a concubine, Andromache was given to Neoptolemus, the son of Achilles. The only small crumb of comfort for Andromache was the fact that she was not alone in the retinue of Neoptolemus, for Helenus, Andromache’s former brother-in-law, was also present. The life of Andromache after the fall of Troy is the basis for the play titled Andromache by Euripdes; and after leaving Troy, Neoptolemus, with Andromache in tow, would settle in Epirus, conquering the Molossian people, and becoming their king. Neoptolemus would then marry Hermione, the daughter of Menelaus and Helen, with thoughts of establishing a powerful dynasty. Problems arose though when it became apparent that Hermione could not bear any children; a situation made worse when Andromache gave birth to three sons for Neoptolemus. These sons of Andromache being Molossus, Pielus and Pergamus. Hermione would begin to plot against Andromache, jealous of the concubine, and also fearful that Andromache has placed a spell on her, to ensure that she could not give birth. The plotting was seemingly coming to fruition, for with Neoptolemus absent at Delphi, and Hermione’s father Menelaus visiting his daughter, Hermione decided to kill Andromache. Andromache knew something was wrong, and taking sanctuary in the precinct of Thetis, Andromache prayed to the Nereid, and hoped that Neoptolemus would return before it was too late. Menelaus would not risk forcibly removing Andromache from her place of sanctuary, but instead threatened to kill Andromache’s son Molossus, unless Andromache came out herself. Andromache of course left her refuge, and Menelaus declared his intention to kill her, although her actions had not necessarily saved Molossus, for Hermione was to decide upon his fate. Andromache and Molossus though would be saved for at that very moment Peleus arrived in Epirus; though now old, Peleus was a hero of some note, the husband of Thetis and the great-grandfather of Molossus. Menelaus’ hand was stayed but news would soon arrive that Neoptolemus would never return to Andromache, for Orestes, the son of Agamemnon had killed him. Perversely though, this act reduced the threat to Andromache for Hermione would leave Epirus and marry Orestes. Helenus, would succeed Neoptolemus as king of Epirus, and so a Trojan was now king of an Achaean Kingdom. Helenus would make Andromache his new wife, and so Andromache was now queen, a position which would have seemed impossible after the death of Hector. Andromache would give birth to her fifth son, Cestrinus, and Helenus and Andromache would rule Epirus for many years. Thus, for the first time in many years, Andromache was content. All good things come to an end though, and Helenus would eventually die, and the kingdom of Epirus would pass to Andromache’s son by Neoptolemus, Molossus. Nothing is said of Pielus, but Cestrinus would aid his half-brother by expanding the territory of Epirus. Andromache though, would not stay in Epirus, for it was said that she accompanied her son Pergamus in his travels through Asia Minor. Arriving in the kingdom of Teuthrania, Pergamus would kill Arius n single combat, and would take the kingdom for his own, and the main city of the kingdom would renamed Pergamon. It was then said that Andromache would die of old age in Pergamon.